There are two books on pricing with free in their titles. One is by Chris Anderson and has the subtitle of, “How Today’s Smart Businesses Profit By Giving Something For Nothing. I wonder how these companies do that, must be the volume. This is of course the new title for the paperback edition, the original subtitle was “The Future of a Radical Price”. I guess the future is here. Rest assured I am not recommending you read this book. 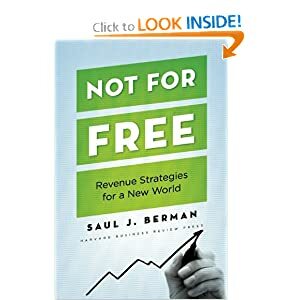 The other book with free in its title is by Saul J. Berman, “Not for Free: Revenue Strategies for a New World”. By new world Saul refers to the current business world that drank the kool-aid of previous book or obsessed with monetization model innovations. And I recommend this book. Saul isn’t as popular or a household name as Chris Anderson is, although a WSJ reported asked me, “who is Chris Anderson?”, when she was interviewing me on my GigaOm freemium article. This book has just 4 reviews on Amazon (all 5 stars, likely his colleagues?) compared to Chris’ book that has 170 reviews. But don’t let what is popular and accepted by your peers let you decide the book to read or your pricing strategy. Chris Anderson’s book talked about the abundance of computing power, abundance of bandwidth etc and how these forces led to a marginal cost of $0 which naturally means $0 price. Saul starts with those same trends disrupting business models and comes to a different conclusion – how important it is to have a differentiated revenue strategy in order to not let these forces drive your business to dust. traditional segmentation approaches are at best correlative—they take an identifiable characteristic and match it with a likely behavior. Why be so indirect? Why not look directly for the behaviors relevant to your industry? Doing so can reveal when consumers are well served with an existing business model and when consumers would be open to new ways of doing things, especially for incumbents. In other words start with the customer needs or the jobs they are hiring a product for and not whether they are in 25-35 demographics. What Percentage of US Teachers are Millionaires?